Come and hear acclaimed AfroCuban scholar Nicolás Hernández Guillén discuss Cuba-Africa connections. As we journey through the United Nation International Decade for People of African Descent, the subject of the Africa’s Children Return! Cuba and African Liberation assumes great poignancy and relevance. Commemoration of Cuba’s role in African liberation struggles, with a tribute to the late Jorge Risquet, an historic member of Cuba's revolutionary leadership and participant in the African anti-colonial/national liberation struggles. Nicolás Hernández Guillén will discuss the history of African-Cuban relationship, the impact of Africa on Cuba and why hundreds of thousands of Cubans were willing to demonstrate such profound solidarity with Africa, especially Angola. He is the president of the Nicolas Guillen Foundation, dedicated to preserving and promoting the work of the National Poet of Cuba, Nicolás Cristóbal Guillén Batista. As an Afro-Cuban Guillen provided very important analysis and commentary on Cuba relations with Africa. Nicolas Hernandez (the grandson of Nicolas Guiilen) is an internationally respected and acclaimed scholar. Speakers include: *John Kirk, leading specialist on Cuba and author the acclaimed book, Healthcare Without Borders: Understanding Cuban Medical Internationalism. "Kirk's invaluable study reveals to us, for the first time, the range and character of Cuba's remarkable achievements, which should be an inspiration and a model for those with far greater advantages." Noam Chomsky; * Isaac Saney, a Cuba specialist who teaches at Dalhousie University (Canada). Author of the acclaimed, Cuba: A Revolution In Motion, he is currently finishing the book Africa's Children Return! Cuba, The War in Angola and the End of Apartheid. * Amet Lo, Justice Committee for Thomas Sankara and Group for research and Initiative For The Liberation of Africa. 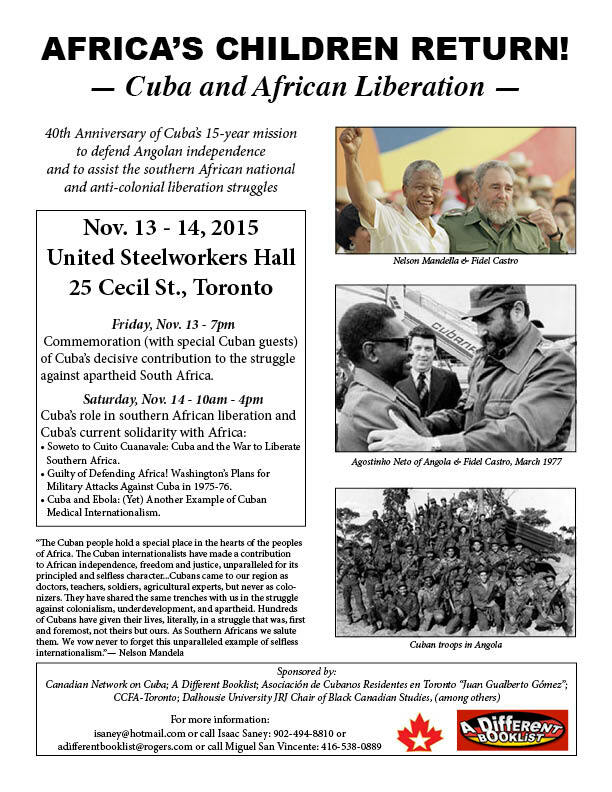 Sponsors include: Canadian Network On Cuba; A Different Booklist; Dalhousie JRJ Chair of Black; Asociación de Cubanos Residentes en Toronto "Juan Gualberto Gómez"; CCFA-Toronto. The World, a Black South African newspaper, underscored the significance: "Black Africa is riding the crest of a wave generated by the Cuban success in Angola. Black Africa is tasting the heady wine of the possibility of realizing the dream of "total liberation." Operation Carlota was named after the leader of a revolt against slavery that took place in Cuba on November 5, 1843. Operation Carlota, Cuba's internationalist mission of solidarity with the Angolan and southern African peoples, was to last more than 15-years. During that time, more than 330,000 Cubans served in Angola. More than 2, 000 Cubans died defending Angolan independence and the freedom and right of self-determination of the peoples of southern Africa. Since the triumph of the Cuban Revolution on January 1, 1959, Cuba has engaged in ongoing solidarity with the peoples and the continent of Africa. In paying tribute to Cuba's assistance to African liberation struggles, Amilcar Cabral (celebrated leader of the anti-colonial and national liberation struggle in Guinea Bissau and Cape Verde) stated: "I don't believe in life after death, but if there is, we can be sure that the souls of our forefathers who were taken away to America to be slaves are rejoicing today to see their children reunited and working together to help us be independent and free." On November 13 and 14, 2015 we will commemorate the 40th anniversary of Cuba's crucial role in the southern African national and anti-colonial liberation struggles, as well as, discuss and examine Cuba's ongoing solidarity with Africa and Africans, and other peoples of the world.